A good night’s rest is essential for a healthy body and brain. It is while we are sleeping that the body renews and repairs – so this is vital to brain consolidation and memory preservation. Without an adequate amount of time to repair, your brain may not be capable of functioning at it’s highest capacity. 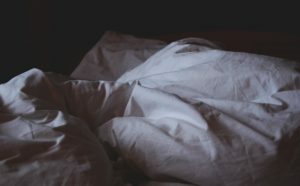 The amount of sleep your body needs is unique to you – and you can’t ‘train’ your body to run on less. For most people, this is somewhere between 6-8 hours (To find out what your body’s ideal sleep number is, set a routine of going to bed at the same time every night, and waking up naturally without an alarm or being disturbed. After a few nights of this routine, you should see yourself waking up after the same number of hours. This is your sleep number and what you should aim to get every night!). Remove clutter from your bedroom, and organise your home so that the bedroom is only a place for rest – no TVs, hobbies, work desks, or other distractions. Get into a routine – try to sleep around the same time every night, and also account for an hour or two to ‘settle down’, a time in which you don’t do any stressful or strenuous activities that will keep you feeling awake and active. Turn the lights off early. Light hinders the release of melatonin – the sleep hormone – from being released in your brain. Turn the lights down an hour before you go to bed and avoid computer or TV screens. Don’t take sleeping pills. There are ‘sleep enablers’ found naturally in many foods, such as milk, oatmeal, kiwis, chamomile, lavender, or peppermint. Don’t drink caffeine after noon. If you still have problems, try going without caffeine at all. Don’t exercise too close to bedtime. It takes a while for your body to settle down. Make sure that sleep is a non-negotiable, high-priority health activity. Just like making sure that you exercise daily and eat your fruits and veg, make sure that you are getting the sleep you require. You’ll be amazed how much better you start feeling every day!